Originally published as two separate books in 1859 and 1860, they have been combined in this publication with the loss of only one illustration which was repeated in the original two editions. The designs contained in this book are of amazing variety. During a workshop on period entertainments, all participants had the opportunity to try many of these shapes. What we can report is that some are relatively easy. Others require a bit of practice before making the silhouette shown in the picture. However, sometimes it is almost magical as you twist your hands and fingers around and then suddenly the image springs out before you. 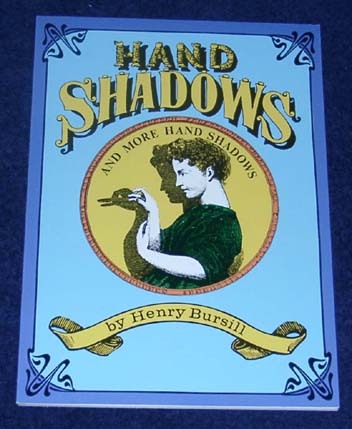 The exercise of making hand shadows is fun for all ages. With the numerous canvas walls, candle lanterns defining points of light, and background darkness of a reenactment, the environment is almost custom made to produce many opportunities to produce shadow shows.